This extraordinary mixed flower bouquet delivers your sympathy with a beauty and faith that reflects the love and loss you feel. The asymmetrical bouquet is hand-arranged by a local FTD artisan florist to make a reverent and respectful setting for an urn of the deceased's cremated remains. 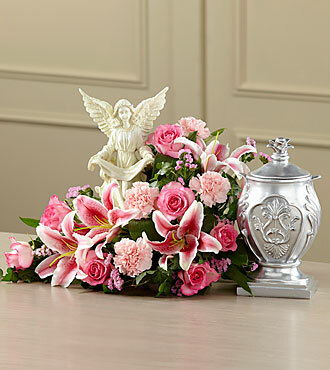 Around an angel sculpted of artist's resin are white roses, carnations, Stargazer lilies, statice and lush greens in a tabletop container that's not visible when set on a flat surface. It makes a fitting focal point for a wake or funeral service. BEST bouquet is approximately 13"H x 22"W.